In the history of Lutheranism, there is a strong defense of the real and true presence of Jesus “in, with and under” the bread and wine with his body and blood for the forgiveness of sins. This accent developed because there developed many in Protestantism that deny Christ’s physical presence and his promise that he provides it for the forgiveness of sins, advocating a “spiritual” presence which, in their view, meant an absence of a physical presence and a lack of an offer of forgiveness in the Sacrament. In this environment something of a distortion of the Lutheran position happened, which is an unspoken denial of a spiritual presence of Christ in the Lord’s Supper. Such an impression of the biblical and Lutheran position is false. 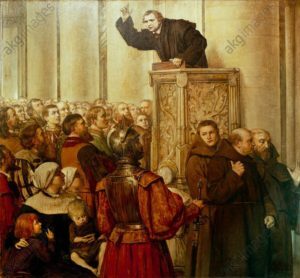 In fact Luther once wrote, “For the natural without the spiritual profits us nothing in this sacrament”. Under the title “Fight, Work, Pray! Luther on the Lord’s Supper and Care for the Needy,” Luther’s 1519 booklet “The Blessed Sacrament Of The Holy And True Body Of Christ, And The Brotherhoods” has been published by Synod. In it, Luther explores the spiritual presence of Christ in the Lord’s Supper and its meaning for the Body of Christ, the Church. As, in 1519, no one yet had denied the physical presence of Jesus in the Supper, Luther was left free to devote far more time to our Lord’s spiritual presence. The connection to our life of love and mercy should not be overlooked. If you follow the link you will find this booklet (sermon). It is well worth reading as we ponder how the Lord’s Supper connects us, not only with Jesus, but also the communion of saints both in heaven and living right next door, aiding us in our relationship with that same communion and inspiring us to serve in love that sane fellowship.